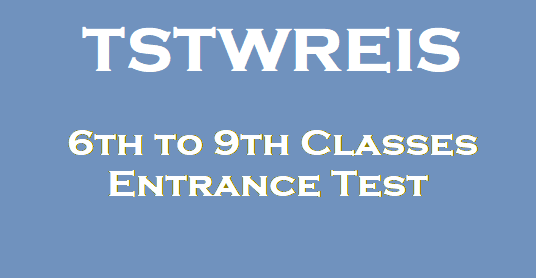 TSTWREIS Gurukulam 6th,7th,8th,9th Classes Entrance Test 2108 - TS Tribal Welfare Residential Admissions,Government of Telangana State, Tribal Welfare Department issued a Government Order for the conduct of Entrance Test for admission into Classes VI to IX in TSTWR Schools for the Academic Year 2018-2019. As per this Government Order the Telangana Tribal Welfare Residential Educational Institutions Society (TSTWREIS) issued 6th to 9th classes Entrance Test 2018 Notification in April 2018 for Admissions into VI to IX Classes backlog vacancies for the academic Year 2018- 19. Applications are invited through online separately for filling up of backlog vacancies in Residential institutions of Gurukulam through the website http://www.tgtwgurukulam.telangana.gov.in and an amount of Rs.30/- will be collected from the candidate while applying for screening test, candidate has to apply through online at the nearby TTWR School or any Meeseva Centre. A screening test will be conducted for admission into VI to IX backlog vacancies of Residential schools and allotment of seats will be done through online on merit basis only.